After splurging to buy her childhood home in the Catskills, recently widowed Mikki Lincoln emerges from retirement as a freelance editor. With her ability to spot details that others fail to see, it's not long before Mikki earns clients—and realizes that the village of Lenape Hollow isn't the thriving tourist destination it was decades ago. Not with a murderer on the loose . . . When perky novice writer Tiffany Scott knocks at her door holding a towering manuscript, Mikki expects another debut novel plagued by typos and sloppy prose. Instead, she finds a murder mystery ripped from the headlines of Lenape Hollow's not-too-distant past. The opening scene is a graphic page-turner, but it sends a real chill down Mikki's spine after the young author turns up dead just like the victim in her story . . .
Mikki refuses to believe that Tiffany's death was accidental, and suspicions of foul play solidify as she uncovers a strange inconsistency in the manuscript and a possible motive in the notes. 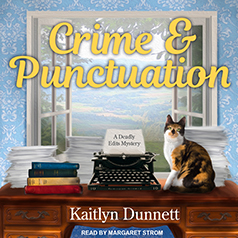 As she gets closer to cracking the case, only one person takes Mikki's investigation seriously—the cunning killer who will do anything to make this chapter of her life come to a very abrupt ending . . .